Perhaps you can start the new year off with a total commitment to eating healthy foods like salads, fruits, vegetables and legumes, without any chocolaty desserts or sweet candies. But I'll bet that come February most of us are about ready for a change of pace. That's where balance comes into the equation. I have been doing well this January, focusing on smoothies, smoothie bowls like my Peach Pie Smoothie Bowl, juices and salads. But I have a long history of devotion to dessert and I know that denying myself any sweets won't work indefinitely. 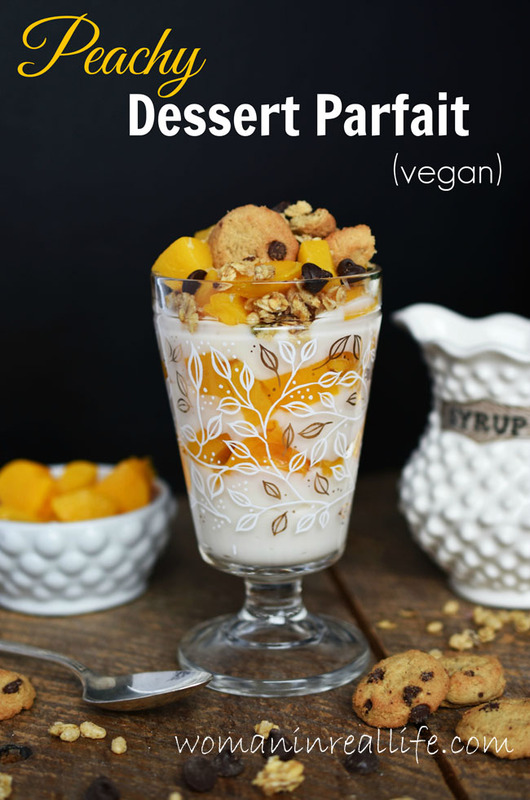 So recently I created this healthy dessert parfait to satisfy my cravings in a healthy way - a way that doesn't encourage overindulging. This dessert parfait features a base of cultured coconut (aka coconut yogurt) mixed with semi-sweet chocolate chips and a bit of maple syrup for sweetness. 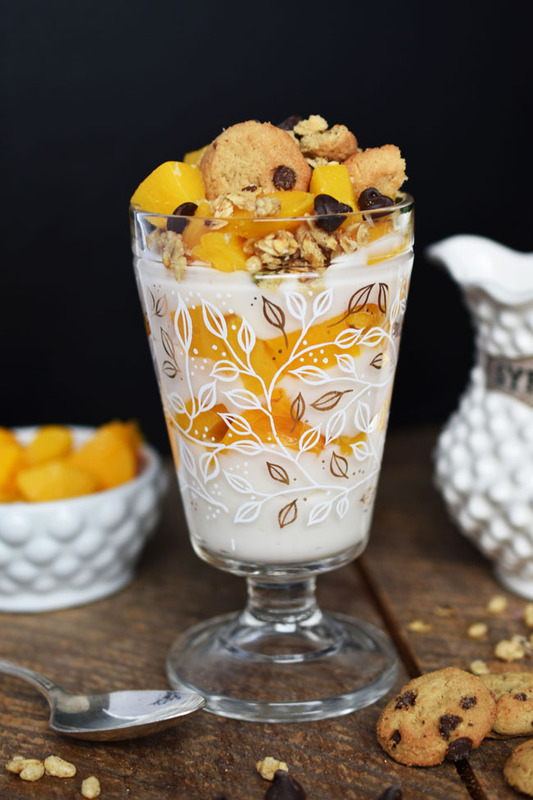 Layering this yogurt mixture with naturally sweet and healthy California cling peaches and crunchy granola makes for a satisfying taste sensation that will have you forgetting about rich, fatty desserts. Just to make sure you're completely satisfied, I recommend crumbling up a couple of vegan chocolate chip cookies for a topping. Just enough of the sweet stuff to make it dessert, but not too much to cause your sweet tooth to kick into overdrive. If you or a friend or family member is eating gluten-free, you can make this recipe work by sourcing gluten-free granola and cookies (or making them yourself). I always keep some canned peaches in my pantry cupboard for a quick snack or to use in recipes. A Michigan State University study found that canned fruits and vegetables deliver the most nutrition for the cost. They are a great option year-round and particularly in winter when the cost of fresh fruits is higher, in part because fresh fruits must be imported from warmer climates. 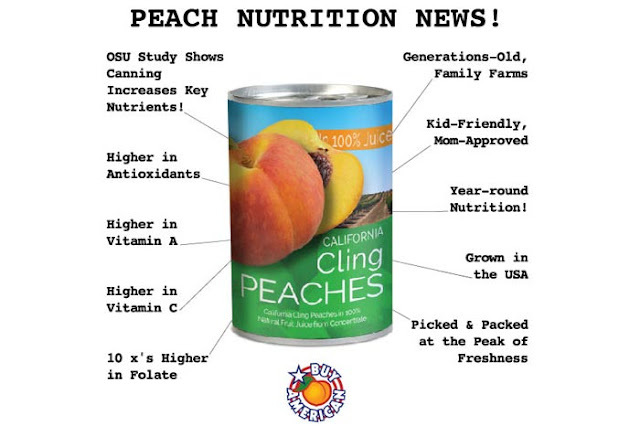 California cling peaches are grown and canned in the United States, on family farms. They have no preservatives and are often packed in their own juice. 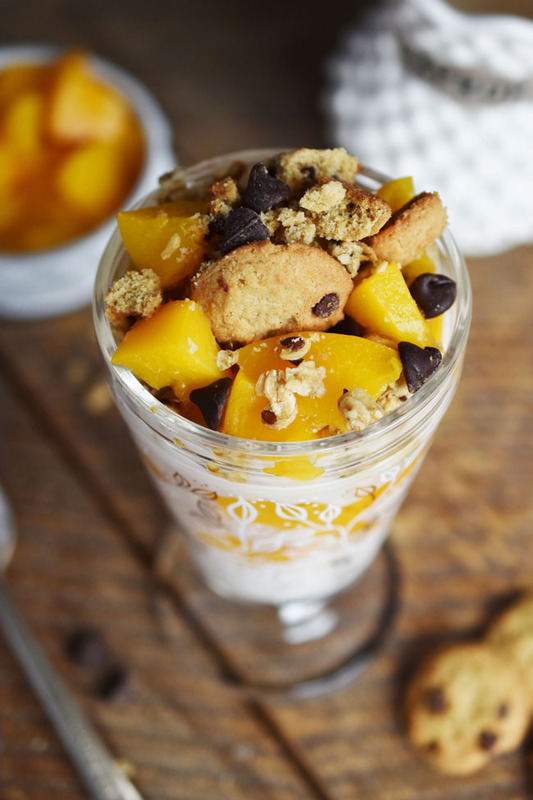 So what do you think - will this quick-to-create, tasty combo of peaches, yogurt, maple syrup, granola and chocolate chip cookies be the dessert treat you need to keep you on track with your healthy living goals right through February? 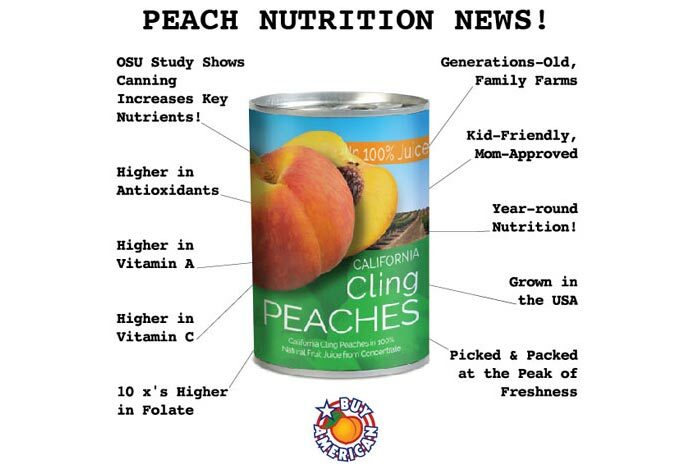 What do you use canned peaches for? I’d love to hear your ideas for getting more of this healthy fruit into your sweet and savoury meals. In a small bowl, stir together yogurt, maple syrup and chocolate chips. 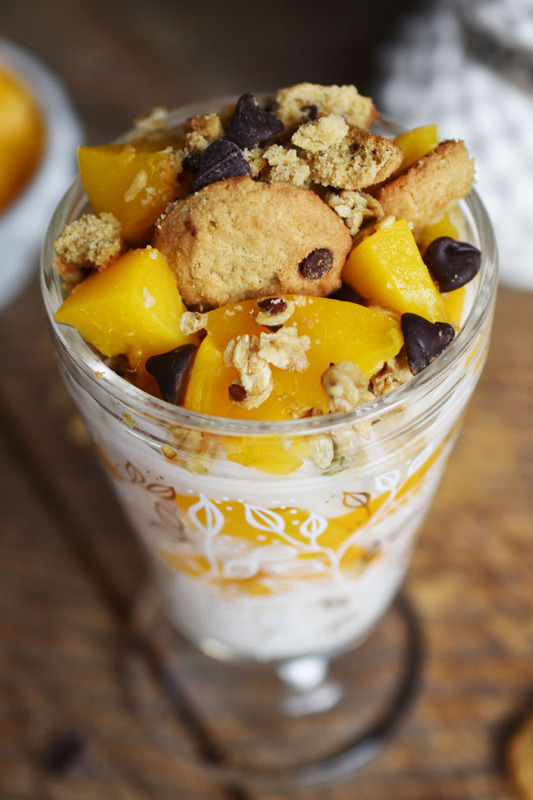 In a serving bowl or parfait dish, layer yogurt mix, peaches and granola. Drizzle with maple syrup if desired and crumble chocolate chip cookies on top. I think two would be perfectly acceptable. ;) And thank you! I never ate cookies in a parfait! I love this idea. Oh, and my favourite recipe using canned peaches was definitely a peach and ginger crumble. I'd use canned peaches for peach cobbler. Yum, yum, yum. 'Cause one yum wasn't enough. Ohhhhh, I love peaches! 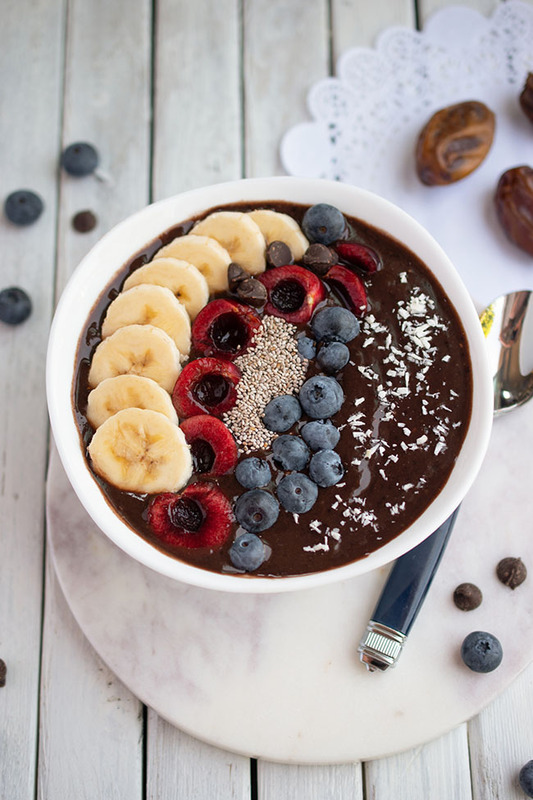 I need to try them in a parfait or with coconut yogurt in general! :) Great recipe. I really like to make Peaches and Cream Torte with canned peaches. I love making dump cakes with canned peaches. This looks so yummy !! I use canned peaches for cheesecake always turns out delicious ! Oooh, sounds good. I need to make a vegan cheesecake with peaches! My husband would love it if I baked a peach pie! Besos Sarah. I'm sure mine would love that too! Not sure it's going to happen though... ;) Thanks Sarah. hmm,I love canned peaches,I eat them by themselves with dream whip on top! I love to bbq halved peaches on the grill, then spoon on a caramel sauce and a little ice cream. And I have a recipe for Peach Brown butter Tart that is my very favourite dessert. Oh yum! I simply ADORE putting canned peaches in rice pudding. It was my mom's specialty, and I have been hooked ever since! This dessert parfait looks wonderful. I would love to use these peaches to put on my yogurt in the morning with a few walnuts too. I use canned peaches for peach pie and peach crisp. Soooo yummy! I'd love to try canned peaches in pie or cobbler! I like canned peaches in my cereal or yogurt. 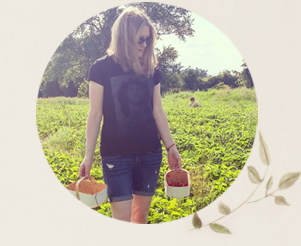 I love making peach crumble or pie. I would make peach cobbler. I would use canned peaches in cocktails, unique touch and they look pretty. I would use canned peaches to make an peach cheesecake. That parfait looks delicious! I'd probably use canned peaches to make a peach pie. With canned peaches, I would use puree, strain, and then serve it as a syrup to homemade icecream! My husband loves to eat peaches with cream on top.